About eight months ago, we were sat on a beach in Thailand talking about all the things we were looking forward to doing in South America. Machu Picchu was there on the list, and it’s actually been something I’ve wanted to do for a long time now. What we have learnt since we’ve been away is that guide books (mainly Lonely Planet guidebooks) are pretty rubbish. They may give you some useful information along the way, but too many times have they led us astray by missing or out of date information; and this trip was one of those occasions. We knew from speaking to various people who had already been to Machu Picchu that if you wanted to do the Inka Trail that you had to book at least two months in advance. As the Inka Trail is expensive and we had no set plans that far in advance, that pretty much ruled us out of the trip. Instead what we found out was that you could get a train up to Machu Picchu instead. This gave us much more flexibility as we could book the trip much closer to the time when we knew roughly when we would be in Cusco. What the various guidebooks didn’t detail is that there are many other treks you can do to Machu Picchu that are much cheaper and readily available. 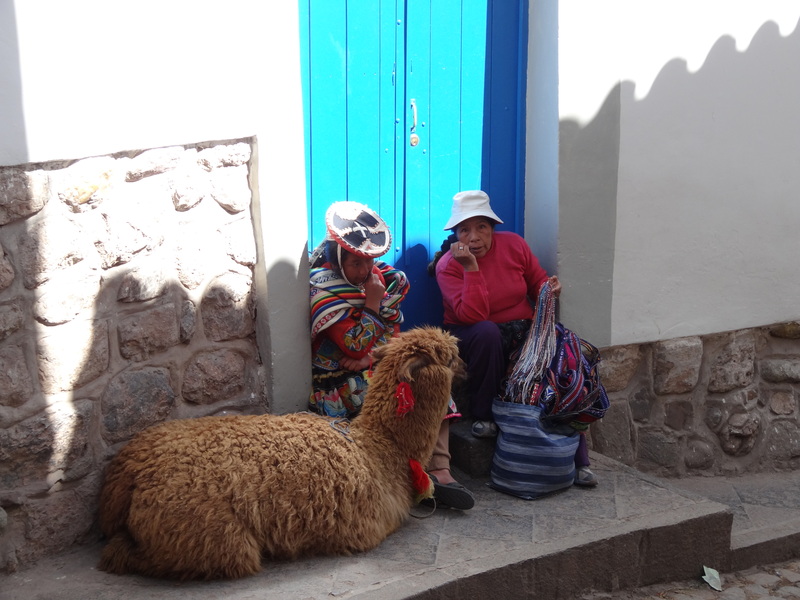 Many of the people we have met in Cusco literally booked their trek two days before the trip. Not being deterred though, we began our train journey from Poroy just outside of Cusco. It’s been a while since we have travelled by train as not many countries in South America have rail systems. It was quite an old fashioned train that moved slowly through the countryside, but it gave us a chance to take in the spectacular views along the way. What we didn’t realise was that Cusco is actually at a higher altitude. The rail system allows the trains to descend very steep hills by using zigzag train lines where trains have to reverse in order to continue. The line has seven full zigzags before continuing normally. Hopefully that makes some kind of sense, as it seems very difficult to describe. The journey lasted about three hours, and along the way we were treated to some stunning views of snow-capped mountains and the rugged countryside of the Sacred Valley. It was actually a really nice way to travel, and we were quite excited by the time we reached our destination, Aguas Calientes. Aguas Calientes is a small town just twenty minutes away from Machu Picchu, and a place that almost everyone who visits the site passes through at some point. It’s very laid back with lots of restaurants, and the rail system passes directly through the centre of town. After checking into our hostel (which had great views over the river) we headed out to buy our bus tickets for the following morning. That evening we went out for a few drinks with two other couples that we met in Cusco who were also visiting Machu Picchu the following day. It was a fairly quiet night as we had an early start in the morning. 04:15am is not a natural time to get out of bed, yet since we have been away I have been up at this time more times than ever. Somehow we managed to drag ourselves out of bed and down to the bus stop by 04:45am. It wasn’t as cold as we expected, but that was probably due to the amount of cloud around that morning. We had been unlucky with the weather when we visited the Great Wall of China earlier in our trip, and it looked like the same was going to happen here. We were very privileged to be one of the first people into the site, and it was great to see it without the swarming tourists that were expected later in the day. We had to arrive early as we had tickets to climb Huayna Picchu at 07:00am. Huayna Picchu is a mountain that overlooks the site, and only 400 people are allowed to climb it per day. I don’t think Katy knew what she had let herself in for until she saw the mountain towering over the site when we arrived. We quickly made our way through the Machu Picchu site to get to the entrance to Huayna Picchu, and then started the ascent. Some parts of the climb were very steep, and there were various moments that Katy looked at me angrily as though it were my fault. It only took us about one hour to make the ascent though, and the views from the top were well worth the effort. As we got to the top the clouds started to clear, and we sat down to eat our breakfast and enjoy the view. After a suitable rest and plenty of photos, we started the walk back down to the site. The walk down was still fairly tricky due to the steep incline, and most people ended up on their bum at some point. It was much easier than the climb up though, and we soon made it back to Machu Picchu in one piece. We decided to chill out in the sun for a bit and let the tour groups make their way around the site. It was really nice place to just sit and take it all in, and it actually didn’t get as busy as I expected. Once it had quietened down a bit, we slowly made our way to the exit before starting the entire loop again. The site is basically a huge one way system, and as we rushed through to get to Huayna Picchu first thing in the morning, we wanted to do it all again properly. We didn’t have a guide to tell us about the site, so every now and then we would tag onto the back of an American tour group for some information. The site was built by the Inkas in around 1400AD, but abandoned a century later at the time of the Spanish invasion. Although known locally, it wasn’t known to the outside world until 1911 when it was discovered by the American historian Hiram Bingham. Most of the site has been reconstructed and the restoration work continues to this day. Machu Picchu was built in the classical Inca style, with polished dry-stone walls. The site was never known to the Spanish during their occupancy, so it is highly significant as a relatively intact cultural site. By the time we had made it around the site again, we were getting very weary. The sun was out in full force, and quickly draining any energy that we had left. Although the site was still open for a few more hours, we decided that we would make our way back to Aguas Calientes for a much deserved beer…we had been up since 04:15am after all. The remainder of the evening was just a countdown to when we could both go to sleep as the day had caught up with us. The next morning we had an early train to Ollantaytambo, an hour and a half away. Ollantaytambo is a nice looking town, with what looked like some nice places to eat and drink. 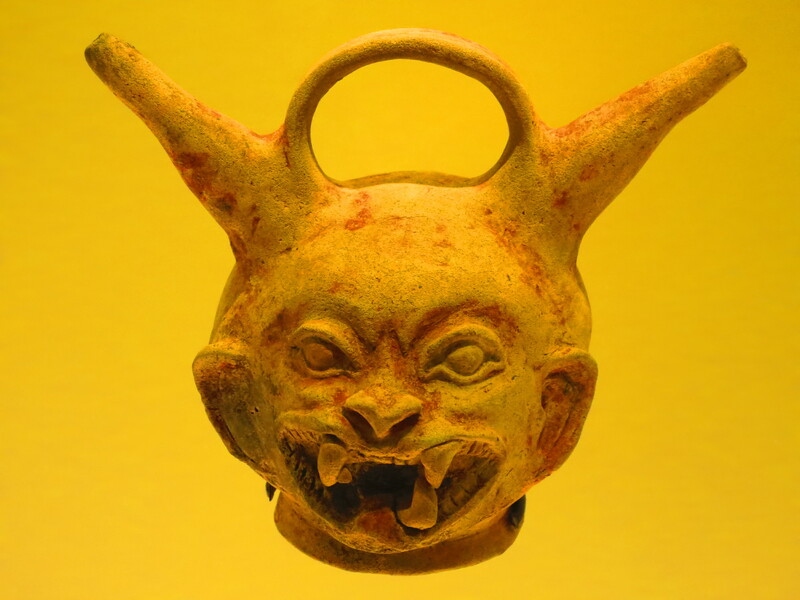 There is also an inka site there that is supposed to be worth a visit. 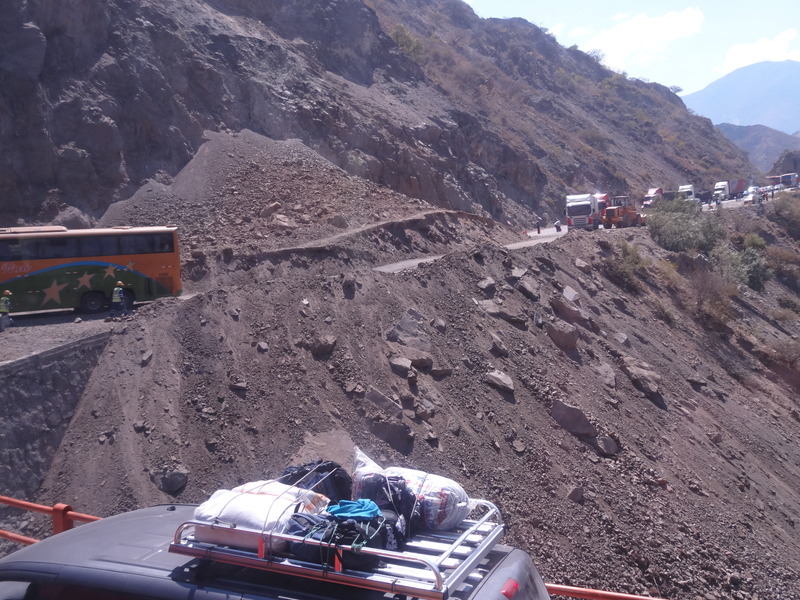 We however were flying through, and we quickly then jumped into a local share taxi to Urubamba. From here we then got onto a very crowded, very smelly and very old bus to Pisac. At one point Katy actually had a man sat on her lap, and most people in the bus seemed to be fairly inebriated, which seems to be a local tradition on Sundays. Pisac is a small town near Cusco that fills up every Sunday due to its market. Similar to Otavalo in Ecuador (although nowhere near as big), this is alpaca heaven. Anyone who hasn’t already gotten their llama fix can be found here looking for bargains. Katy’s latest treat, some alpaca leg warmers…very 1980s. So now we have left Cusco on another night bus. It was an amazing weekend, and one that we’ll remember for a long time to come. We had high expectations for Machu Picchu, and we weren’t disappointed in any way. Everyone we had met who had been to Peru, told us that we must travel with Cruz del Sur…the best bus company in Peru…and the most expensive. So when we were booking our bus ticket to Lima, we ignored all the advice and decided to go with a budget option instead. Never again! After three tuk tuks and a five hour bus journey to the middle nowhere, where we were the only gringos in sight and everyone looked like they wanted to rob us (maybe I’m just paranoid now), we finally got on our bus to Lima. It was at this point that I threw my toys out of the pram and said ‘no more budget buses Sam, its Cruz del Sur all the way, whatever the cost’…surprisingly he agreed with me! We had booked what I thought looked like a nice hostel in Lima…private room with en-suite in a good area (Miraflores). When we arrived however, the place looked like it was falling down and the very damp private room didn’t have an en-suite. The owner was very apologetic (and a bit mad) and ended up offering us two nights for the price of one if we stayed there. Never one to pass on a bargain, we agreed to stay. That night we treated ourselves to the biggest Domino’s pizza I have ever seen, and ate it in bed whilst we watched a film on the lap top…bliss. After two nights we left the run down hostel and checked into a much better one which even had cable tv and our own kitchen. We had a great few days doing absolutely nothing. We went to the cinema to watch Batman, watched some of the Olympics and ate far too much blue cheese, pate and bread. We also managed to buy another camera which makes it our fourth of the trip. Hopefully this one will last the remaining four months. 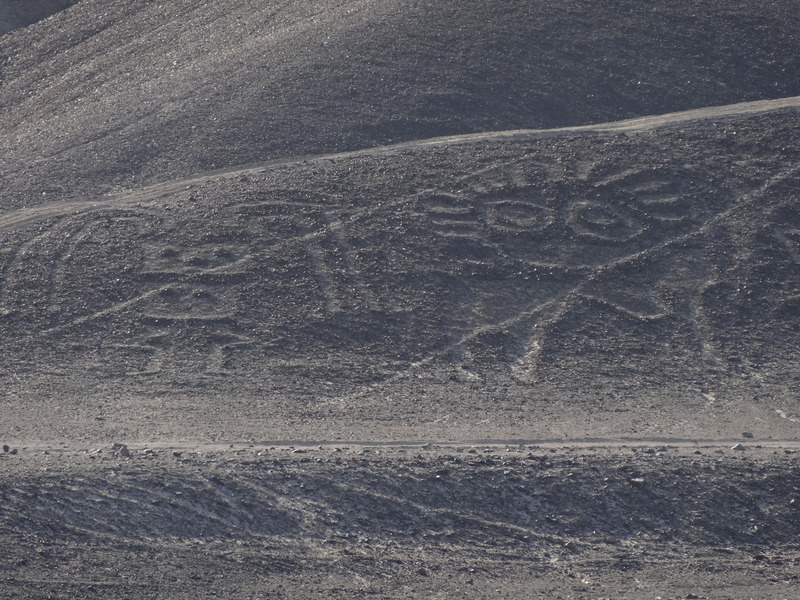 We decided to break up the journey to Cusco by stopping at a small town in the middle of the desert called Nazca and its famous Nazca lines…anyone heard of them? No me neither. Small history lesson for you…the lines were discovered in 1939 when a routine ancient irrigation flight found them…like graffiti or giant carvings in the desert floor. Nazca is now a UNESCO World Heritage site and people flock here in their thousands to get a look at these lines. The idea is that you take a small plane and fly over the lines but of course this was too expensive for us so instead we went on a tour which took us to an observation tower where we could get a glimpse of some of the lines. As Sam has mentioned in previous blogs, it takes a lot these days to impress us and unfortunately this was not one of those times. I was however impressed with Cruz del Sur…blankets, pillows and breakfast all provided and very comfy seats. 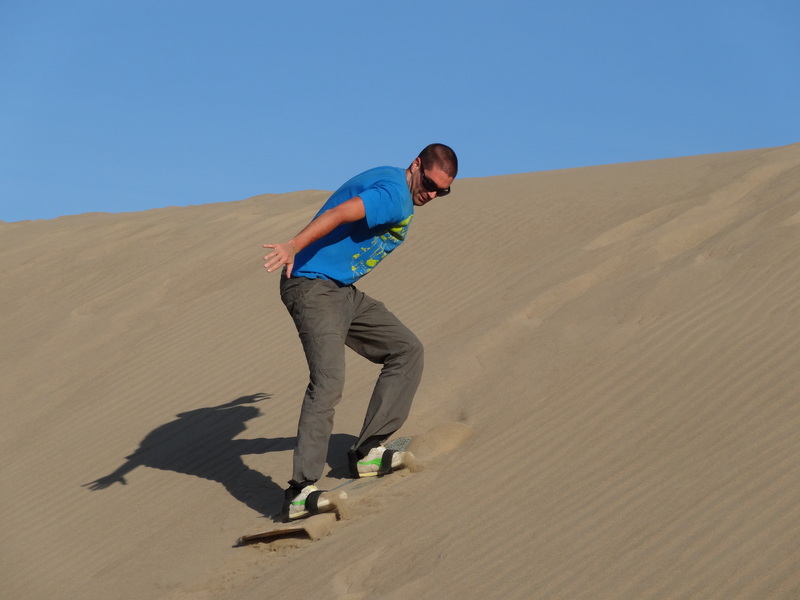 Another thing to do in Nazca is sand boarding. We signed up for an afternoon which also included a visit to a couple of burial sites and pyramids. He also showed us a mummy of a child that was sacrificed. It was a bit of a strange thing to see just in the middle of the desert. In most other countries it would be in a museum rather than just left out in the open. The guide then took us out to some sand dunes which were stunning and then decided to have some fun by driving the sand buggy up to the top of a dune, stopping at the top so we tilted over and then at full throttle going down…scary but great fun. Then it was time to actually try sand boarding. We started on some smaller sand dunes going down on our bellies just to get comfortable on the sand. 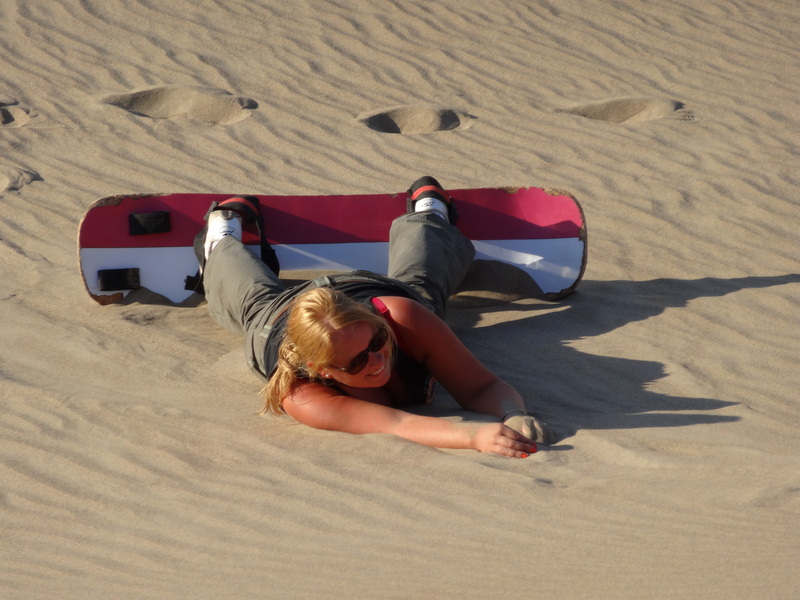 The sand boarding part was really hard…well I found it hard but Sam seemed to pick it up quite quickly. I had a couple of try’s and then spent the rest of the time going down on my belly…much more fun. Some of the dunes were really steep, and we were taken to higher and higher dunes as the afternoon went on. We ended the day with a very cold journey back through the desert to the town with our clothes full of sand…literally everywhere and even now Sam is still emptying his trainers of sand. We met another English couple in our hostel who we travelled with to Cusco. Again, another Cruz del Sur bus but this time with luxury seats, dinner and breakfast provided. We had a fairly uneventful journey until about 8.30 in the morning (by this time we’d been travelling for 12 hours). We were woken up with breakfast and the bus abruptly stopping. It looked like a traffic jam but we soon found out it was actually a landslide just up ahead. We all got out to have a look, take pictures etc…whilst getting bitten to death by mosquitos and hoping we’d be on our way soon. No such luck…it took five hours to clear the road and with no air-con and sat in the sweltering heat it wasn’t a very pleasant five hours. We eventually arrived in Cusco around 3pm, checked into our hostel and unpacked for Sam to find that his kindle was missing. We phoned the bus company just in case he’d left it on the seat and someone handed it in but there was nothing. We actually think someone took it out of his bag whilst we were out stretching our legs. Surely our luck has to change soon! Cusco is 3400m above sea level, and it’s really noticeable how much the altitude affects you. Just walking up a short flight of stairs can leave you puffed out…at least that’s what I am blaming it on. Even though we were knackered and upset about the kindle we’d heard about an English pub serving roast dinners on a Sunday. We enjoyed only our second roast dinner in almost 11 months, washed it down with a local beer and had an early night. We’ve been in Cusco for five nights which is probably a bit too long really but it’s a nice place to walk around and very touristy which is actually quite nice once in a while. We’ve been busy sorting out our insurance claim, getting all the relevant documents printed and scanned which we’ve now sent off so fingers crossed we get a bit of luck there. We have also enjoyed some local specialities including Alpaca and Cuy while we have been here. The Alpaca (Llama) was very tasty and a bit like veal and was served in a black pepper and aniseed sauce. 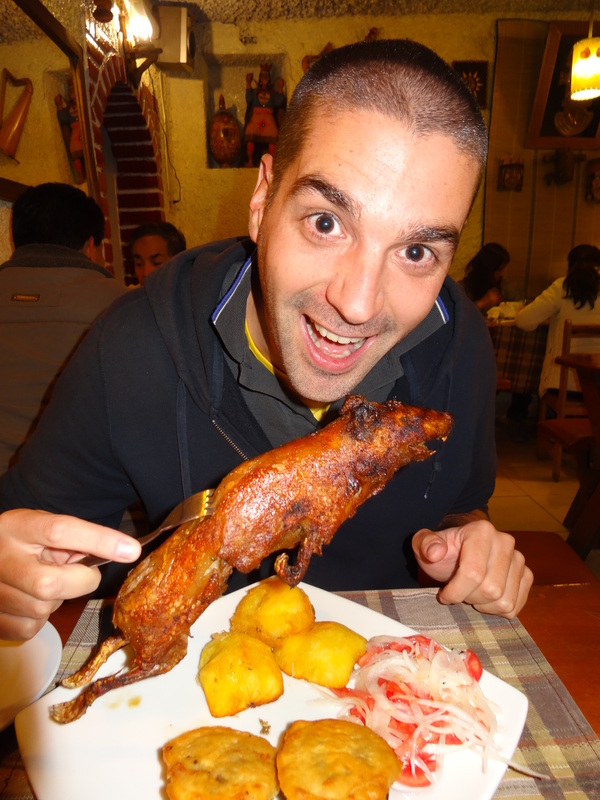 Last night we finally got around to trying Cuy…roasted guinea pig. We had to pre order it as it takes about one hour and half to roast and it came with roast potatoes and stuffed bell peppers. It was ok, not my favourite meat to be honest and there wasn’t a lot of it but the little we did have tasted of lamb. As you can see from the photos, they serve it whole…head, claws…the lot, which makes a great picture but doesn’t make it easy to eat. Today is our last day in Cusco and we decided to go on a free walking tour of the city. We’d been told by a few people that it was really good so decided to give it a go. The tour lasted about three hours and included a gastronomy tour which I especially enjoyed. We visited the chocolate museum where we got some free samples as well as a chocolate tea…nice. Then we were treated to another local speciality…Causa which is layered potato, avocado and chicken or crab in mayonnaise which was absolutely delicious. At only 75p for a slice, we’re going back later for more. The gastronomy tour also included a Chinese restaurant where we had Chinese cookies, an ice cream parlour and a bagel shop. Not all local food but nice none the less…and free! The tour ended with a short hike up the hill to a point where we had amazing views over the city. The tour was a great way to see a bit more of the city and I can highly recommend it to anyone visiting Cusco. It’s just a shame that we didn’t do it on day one. After having such a great time on the north coast of Colombia, we somewhat reluctantly began the long journey south to Peru. Our first stop on the way was Colombia’s capital Bogota; a 21 hour bus trip away. The journey itself wasn’t too bad, but we were both relieved to get off and stretch our legs. Everyone had warned us that Bogota is cold but it was actually quite warm when we arrived, and we looked fairly overdressed in our alpaca jumpers. However that night we were so pleased to have our llama clad clothing, as the temperature plummeted and it was absolutely freezing. We weren’t in Bogota long, but we had been told by several people that we should visit the gold museum. It wasn’t far from our hostel and was fairly cheap to get in, so we went to take a look. At this point in our trip it takes a lot to get us excited, and sadly this was not one of those times. It did have a huge collection of gold dating back thousands of years, but we’re obviously very hard to please. We also visited an art museum with various modern pieces including dozens from the famous Colombian artist, Fernando Botero. Our next stop was San Agustin, and this couldn’t have been more different to Bogota. 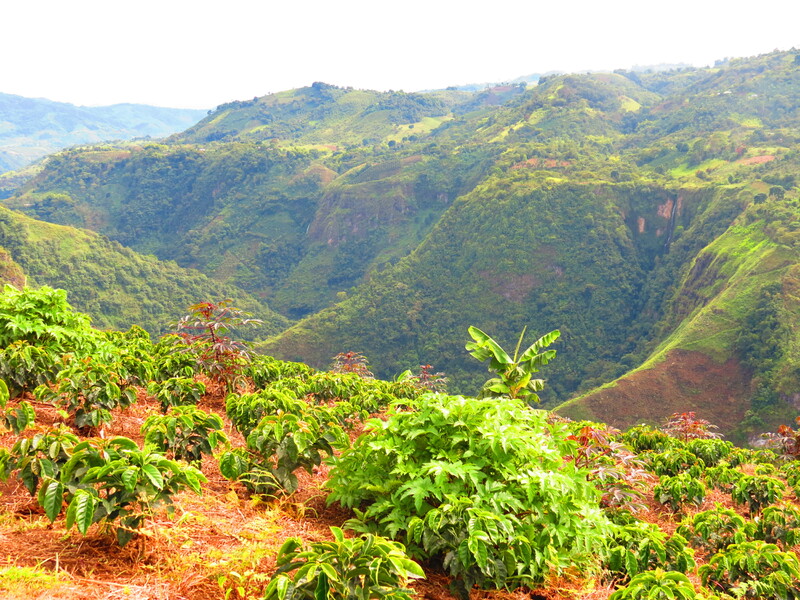 It is a tranquil country town with stunning views of valleys, waterfalls and undulating hills. But the main attraction, and the reason that most people visit the area, is because San Agustin is a world heritage site. 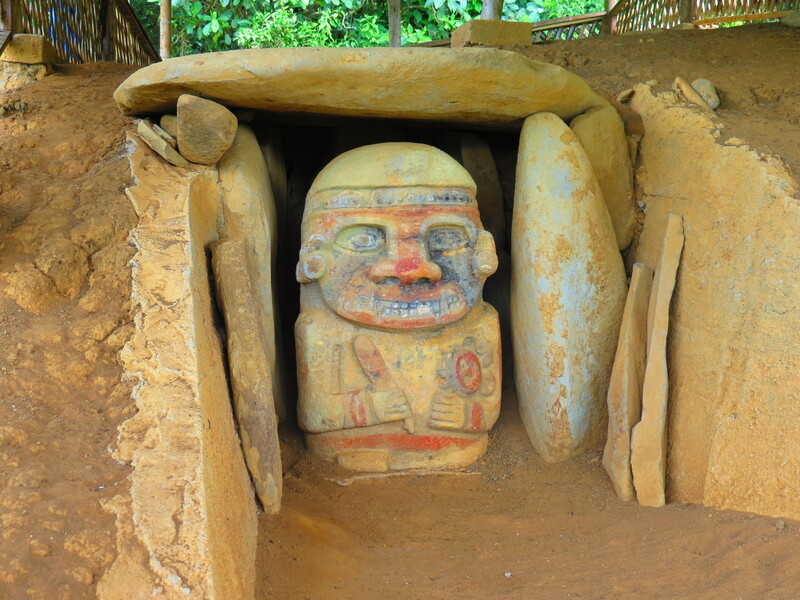 Dotted around the countryside are hundreds of statues which date back thousands of years. Never one to encourage walking, Katy decided that we should take in the sights via horseback. We had managed to barter a good deal by joining two other English people we had met at our hostel, Sophie and James. I was a bit apprehensive as I had never ridden before, and my brief lesson (in Spanish) didn’t do much to reassure me. All I was told was to pull on the reigns to stop, and at that point he slapped the horses arse and I was on my way. Thankfully he was quite a well-behaved horse, and I was doing fairly well to hold on. It didn’t take me long to work out that it was much more comfortable when the horse was actually running a bit (cantering for those in the know). Not that I really had much choice in the matter. Katy made the mistake of telling the guy she had some experience so was given a very excitable horse, and every time he started to speed up, all four of the horses joined in. 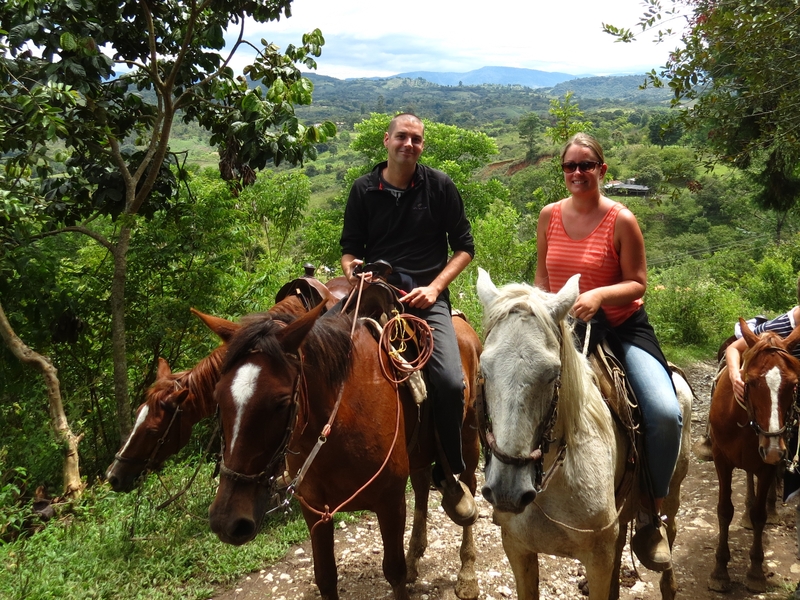 It was a great way to do it, but after four hours in the saddle I was so relieved to get off the horse. It is not natural for a man to ride a horse, cowboys or no cowboys. We retreated back to the gorgeous setting of our hostel (cushion in hand) for a few cold beers in the afternoon sun. The same day was Colombian Independence Day, and we had heard rumours of big parties and live music in the small town. We were disappointed though as there was absolutely nothing going on. Instead we headed back to the hostel and the four of us drank the French owned hostel out of red wine. Katy did point out that no French bar / restaurant should ever run out of wine, but by that point I think the owner was relieved that we were going to bed. The following morning we were on the move again and heading back towards Ecuador. We had to have another night in Popayan to break up the journey, and were up again before sunrise to begin our worst day travelling so far. First we had an eight-hour journey to the border, followed by a four-hour wait in the small border town called Tulcan. Then we had a 14 hour overnight bus to Guayaquil in the south of Ecuador. Our bad streak with cameras continued as our camera was stolen from our bag before we arrived in Guayaquil. I even think I know who took it on the bus, but when we told the driver and a police officer at the bus station they just waved us away. Not really a nice way to wake up after an entire day travelling, and we still had to wait another three hours before getting yet another bus to Montañita on the Pacific coast. It took me a few days to calm down after having the camera stolen, but Montañita was quite a good place to do so. It’s a small town with a fairly nice beach, and has hundreds of hostels, bars and restaurants busy with both locals and foreigners. On the weekend it fills up even more with locals visiting from nearby towns and cities, and can get quite rowdy. We just enjoyed some sun and did very little for the first few days. While we were there we did get to enjoy the opening ceremony of the Olympics with an English couple we met, Chris and Morven. I thought some bits of the ceremony were really good, and some others were quite bizarre. Overall though I think it was a success and it definitely gave us an afternoon of entertainment. A lot of people have asked us if we were glad to be away for the Olympics, and I think in some ways we are. The thought of getting home on the Central Line during the games is not a nice one. But it is a shame we are not there to watch it and just to be in London during the games. I imagine there is quite a buzz to the city right now. Before we left Montañita, we went whale watching an hour up the coast in a town called Puerto Lopez. 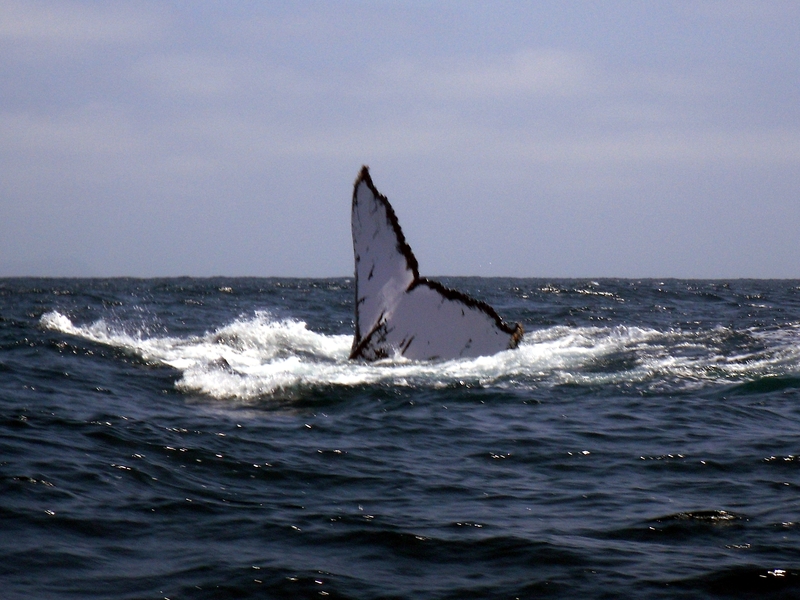 It is mating season for humpback whales, so we were pretty much guaranteed to see them. This was one of those occasions that we could have really done with our decent and recently stolen camera, but instead we had to take our rubbish backup camera. The trip itself was amazing, and I was surprised how close we got to the whales. We spent a few hours in one area watching them before we left to go and do some snorkelling. On the way, a huge whale (about 15-20 meters) jumped out of the water if front of us. 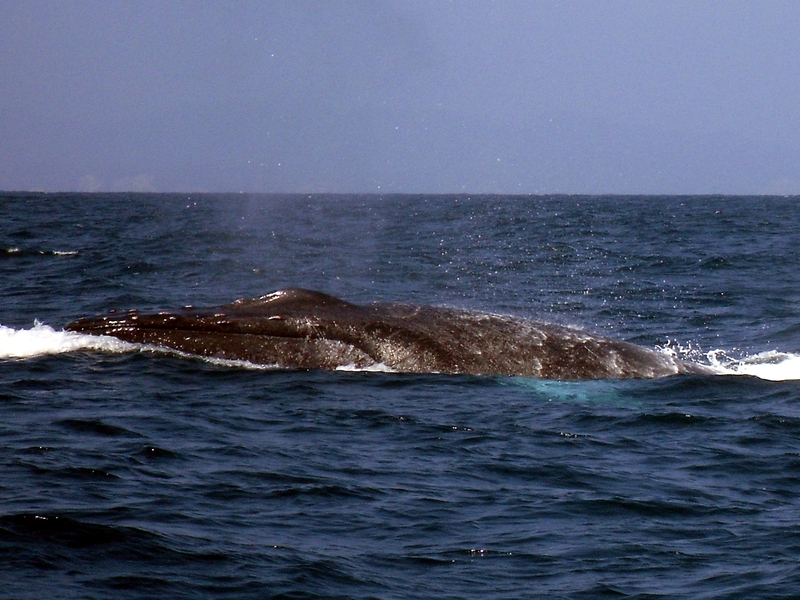 It was a truly spectacular sight, and it actually continued to breach the water right next to us. Everyone on the boat decided that they would rather watch the whale than to go snorkelling, so we stayed there until the whale decided to dive and was nowhere to be seen. On the way back to shore everyone on the boat got absolutely soaked as the captain just decided to go full throttle regardless of the big waves. It wasn’t the best end to our trip, but overall it was a great day out. Peru was next on the agenda, and after yet another night bus we arrived at the coastal town of Máncora. We had been recommended a hostel that was just outside of town, so when we arrived at 4:00am we got a taxi straight there. We hadn’t expected to get there until about 7:00am, so we were hoping that the hostel might have a spare room so we could get some sleep. 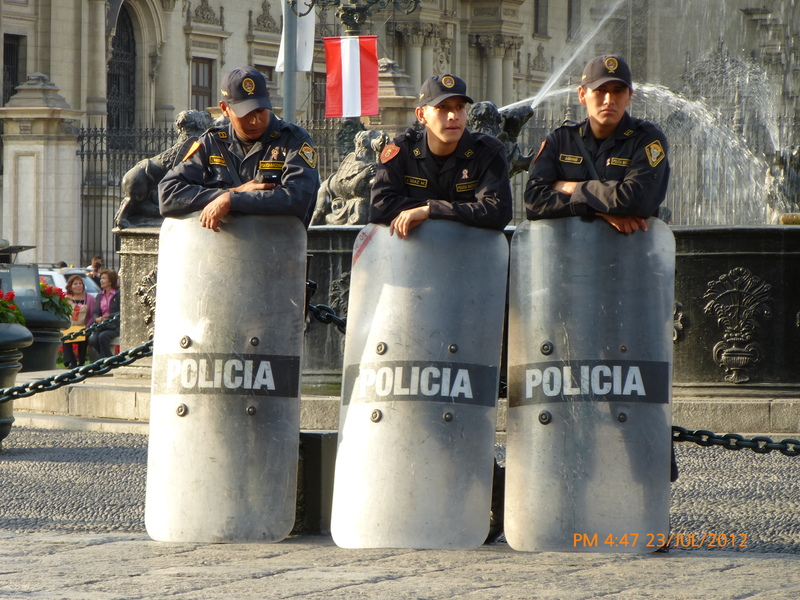 However we had arrived on Peru’s national day, so every room was booked out and the party was still going. We were told that we could use the hammocks around the pool until a room was available at lunchtime. Once we eventually got settled in, we got to enjoy the sun and a nice pool. With the help of one of the hostel staff and a tour operator in Cusco, we also managed to book our Machu Picchu trip. All we had to do was visit the local bank the next day and pay for it. We went into town that evening for dinner in one of the many beach-side restaurants, and enjoyed a few beers to welcome us into another country. The next day we had the worst experience of our trip so far, and one that I hope we never have to go through again. We went into town and paid for the Machu Picchu trip, and while we were there decided to check out the bus times so we could plan our next trip. We wanted to walk back along the beach, so we cut down a road towards the shore. After walking a couple of hundred metres, we said to each other that it felt like a dodgy neighbourhood, and seconds after that it began. About five locals ran out of a house towards us, two of them brandishing knives. One of them waved me away with his knife while he grabbed the bag from Katy. In the bag were our passports, credit card, debit card, iPhone, camera, Machu Picchu ticket…everything. I chased them through another house they had run into, but they had already gone out of the back door and into a tuk-tuk. Two of them had stayed behind and were actually talking to Katy, asking what was in the bag. After a few minutes of shouting at them that saying that we just wanted our passports back, we decided to walk back to the main road and get out of there. Before we got back to the road though, the two men we had been shouting at actually brought our bag back. The camera, money and iPhone had been taken, but everything else was in there. It was quite bizarre. It was quite traumatic, especially as it happened in broad daylight in front of people, but it could have been a hell of a lot worse. Obviously the main thing is that we weren’t hurt, but it took us a while to calm down. That night I went to the police station to report it, and thankfully was joined by an Argentinian guy called Juan who translated for me. Nobody at the police station spoke English, so there is no way I could have done it without him. It’s been a strange couple of weeks, and a time that we definitely want to put behind us. I’m sure it will make us a bit more wary from now on, but hopefully it won’t stop us enjoying the rest of our trip. 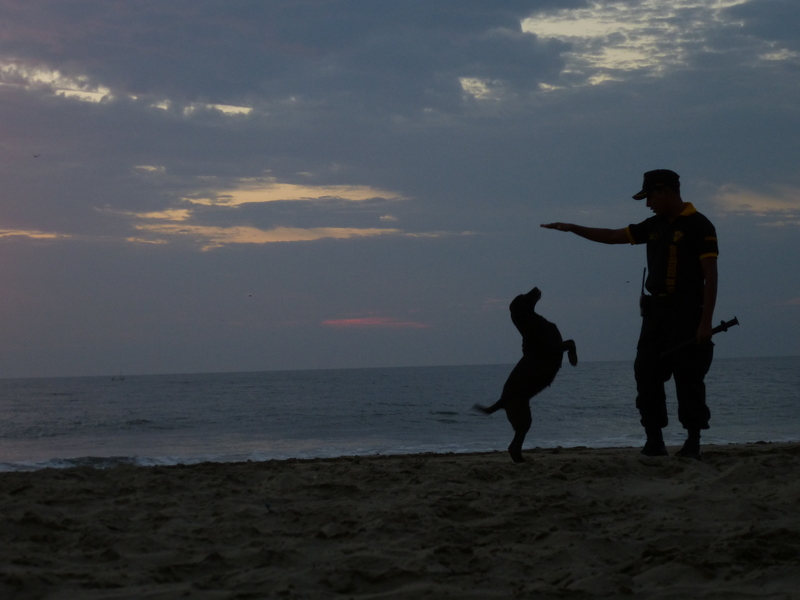 We’re in our final day in Máncora now before heading south to Lima. Let’s hope that our next overnight bus journey goes slightly better than the last.